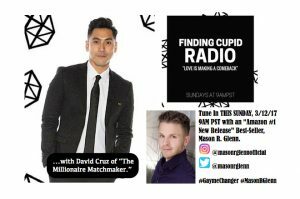 Mason and David Cruz, of Millionaire Matchmaker, and owner of Finding-Cupid.com, have a great chat from matchmaker to matchmaker. Both of them explore common dating behaviors that attribute to dating success and failure. Mason also goes into a couple of “no-no’s” when it comes to creating the best first impression while dating online. There is a free iTunes download, or feel free to listen to the live conversation on the Finding-Cupid Facebook page.